Volunteer & Intern With Us! If you are interested in helping spearhead the effort to bring greater peace and justice Latin America communities, Witness for Peace has multiple volunteer positions and internships available. An updated list of volunteer positions can be found here. If interested, please send an email to wfpse1@gmail.com. If you know what you might be interested in doing, please specify that in the email. Otherwise, we can discuss all the volunteer opportunities once we connect! During both fall and spring semesters, as well as over the summer, Witness for Peace offers part-time internships to Triangle-based undergraduate students. In the past, students have coordinated our Pilgrimage for Peace and Justice, overseen our Speaker’s Tours, and mobilized delegations. After interning, many students continue to be involved in Witness for Peace (we’re so grateful for their passion for our work! ), either traveling themselves on a delegation, joining our board of directors, or continuing to volunteer in a wide variety of capacities. Speakers Tour. Attend a lecture in the fall of each year to hear a guest speaker from Latin America address the issues of the day. Lectures are held throughout the southeastern U.S. and are free and open to the public. Want to get even more involved? Organize a Speaker’s Tour event yourself! In the past speaker’s have spoken to University classes, high school classes, church congregations, and local non-profit groups. 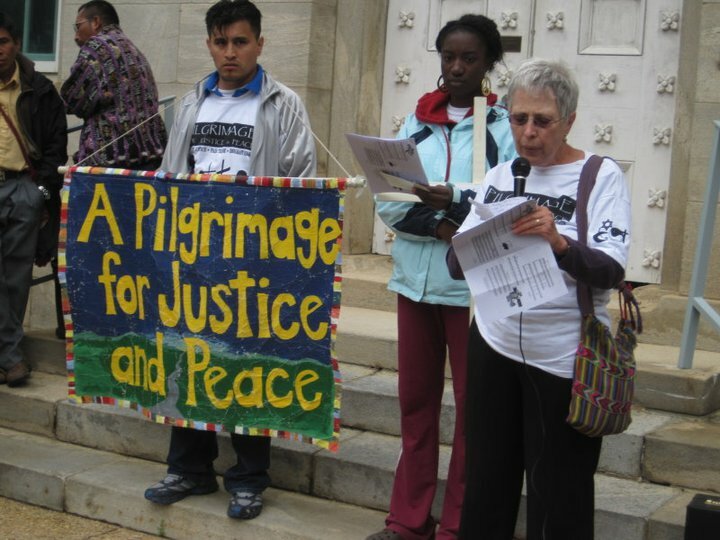 Caravan for Peace and Justice. Each spring we engage in a week-long march across North Carolina to raise awareness for social and economic issues. This year we walked to demand an end to free trade agreements, the drug war, and incessant US militarization. We walked to welcome refugees and immigrants to this country. We walked in solidarity with the Black Lives Matter Movement and with Farmworkers. We walked in solidarity with all those whose voices are continually suppressed in our society. Learn more HERE. Host our Traveling Art Exhibit on Colombia: In July 2017, as part of a delegation Witness for Peace, Donna Slade visited Colombia. After witnessing personal and revealing accounts of the social inequities perpetuated by US policies in Colombia as well as the local peace building efforts of Afro-Colombian and Indigenous communities she returned to the US and began working on an art exhibit that would help bring the stories of Colombian communities to the US. This exhibit will be traveling throughout the US for the next year. Learn more about the exhibit HERE. We would like to keep the exhibit traveling for as long as possible. To host the exhibit, contact us at wfpse1@gmail.com! International Delegations. Join us in Colombia, Mexico, Nicaragua, Honduras, or Cuba and experience Latin America for yourself. On delegations, you meet with local communities and organizations, hear their stories, and learn how you can be a part of their struggle for change. Get more information here! Explore the US role in the Honduras human rights crisis, with a special focus on criminalization and incarceration of human rights and environmental rights activists in Honduras. Delegates will learn directly from leaders of various human rights and grassroots organizations as they share stories and legal and political organizing strategies for fighting violence, persecution, and impunity. Explore connections between policing, criminalization and the prison industrial complex in the US and Honduras. Learn about illegal land grabs by corporations; the criminalization and repression of political protest and expression; governmental and police corruption; and the increasing militarization of Honduran society. Gain knowledge about the impunity that pervades the Honduran justice and law enforcement systems with most acts of violence and murders, violations of human rights, corruption, and illegal corporate activities going unpunished. Meet US embassy officials to share what delegates have learned and to urge changes in US policy in Honduras. Delegation fee covers all meals, lodging, interpreters, and transportation within Honduras, along with extensive reading and activist tools. Application & $250 Deposit Deadline: December 26, 2018. Discover the Parallels Between Black Americans & Black Cubans: from slavery to the present while exploring sustainable agriculture, healthcare system, education, politics & culture. 90 miles away from the US coast, Cubans have one of the best healthcare systems in the world. The World Health Organization praised Cuba’s preventative healthcare model and calls other countries to follow it. In 2016, Cuba’s infant mortality rate was 4.3% per 1,000 live births as compared to Tennessee’s rate of 7.4%. Join us to discover Cuba’s history of social reform, its relationship with the US, preventative healthcare model, educational system and culture. Explore sustainable agricultural practices at 2 organic farms. Explore Cuba’s medical and mental healthcare system, prevention efforts and treatment. Explore restorative and preventative healing practices such as yoga, tai chi, herbalism and homeopathic medicine. Explore Cuba’s educational system, the historical Literacy Campaign. Tour the International School of Medicine. Learn the impacts of the US embargo on the lives of Cubans. Learn about racism from a Cuban historian. Meet with a family doctor to learn about Public Health Care. Learn from a local teacher of dance and traditional rhyth. Explore the preservation of Afro-Cuban spirituality, Santeria. Visit the House of Africa. Delegation fee covers all meals, lodging, interpreters, and transportation within Cuba, along with extensive reading and activist tools. Application & $150 deposit due: December 2, 2018. Remaining Balance due: February 8, 2019. Your donations help with administrative and operating costs. We would not be here without the help of our gracious donors. Whether $1 or $1000, every little bit helps us. Please consider giving what you can. Click this link to donate now!